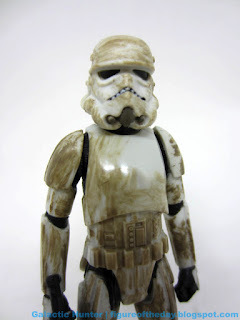 Commentary: I like this Stormtrooper (Mimban), but I wish it had some more paint and could be bought by the dozen. Unlike the single-carded counterpart, this one has no cape and comes with the 5 traditional joints - the neck on mine only swivels, rather than having a full range of motion. It has a wonderful swamp wash over it, but numerous helmet details are left off. The single-carded figure had less going on than this one, which adds mouth vents and a little more variety on the chin area. The "ears," the jaw vents, and the entire back of the helmet remain undecorated - but as a driver figure, this sort of thing isn't exactly a huge problem. The figure look just fine and is a bit hard to get at press time. 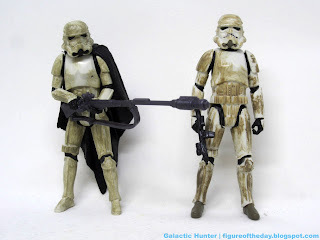 He stands, he sits, and he can pilot the ship with no problems whatsoever - I would have loved a weapon storage compartment, but there's no problem with the trooper holding the blaster while seated. 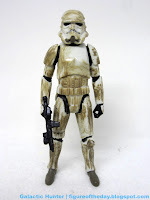 The sculpted details are nothing particularly new here - it does appear to be a mostly new sculpt, but it's a Stormtrooper and seems to share some similarities in design with the Rogue One figures. The included vehicle is an interesting one. I find big, armored craft with wide-open driver's seats kind of stupid, mostly because any idiot can get knocked out or ripped out by a large, stronger person. If you can get past the fact that you've got an open bunker on legs, it's pretty awesome. The AT-DT has a rocket launcher, plus a button on the head that causes it to explode. It's a real toy! The cannon flies off and the seat blows out, ejecting the driver. I really like this. I also like that the legs are jointed in two places so you can balance and display this vehicle, and the ball-jointed ankles ensure you can do some neat dioramas with it. The toy is cast in a brown-tinged grey, painted with splotches of mud as well as some dark grey and off-white on the feet. Why, I don't know, it's a mud planet not from that one party scene in Logan's Run. It's a fine vehicle, and I hope to see Hasbro continue to crank out more new toy vehicles with this level of sophistication. I got it assembled in about 4 minutes. Snapping the legs in took some force. You might not be thrilled to pay $30 for this, but if you figure the driver at $8 and the rest at $22 it's pretty decent. I like the quality and I like the design, mostly, if you can forgive the design flaw of a tank with a driver exposed to the enemy. At least it looks Star Wars-y and as good if not better than my mini-rigs. It was basically designed as a German 88 Flak gun from WW2 attached to the legs of an AT-ST. The 'head' is very nearly an un-altered German 88. Those flak guns had open canopies like this. In fact, you very lucky if you even got one with the shield protector on it.